These NPK (Nitrogen, Phosphorous, Postassium) products are appropriate for sustainable agriculture production. 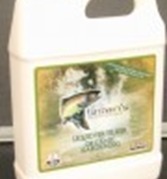 These NPK liquid fertilizers are naturally complexed for foliar and/or foliar application. Natural plant and soil derivatives designed to maximize the efficiency of liquid fertilizers. (Calcium, Magnesium, Sulfur) Fast growing plants are often deficient in these elements. Extremely important in all soils, especially important for Na buffering and leaching. Also important for soil tilth and prevention of crusting. Micronutrients or trace minerals can be the limiting growth or quality factor even in well mineralized soils. Soil and petiole tests can indicate plant needs. Naturally occurring substances which can "turn on" on increase a wide range of plant metabolic functions. Applications should be properly timed and accompanied by plant nutritive inputs appropriate for high yield goals.